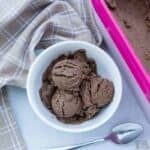 I have over two dozen no bake low carb desserts on the blog. When I get some down time this summer, I’ll add this newest one. But for now, I’m going to teach you how to make it. 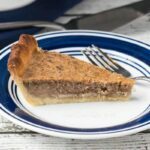 This recipe that will teach you how to make a bakeless crust and pie filling. 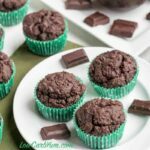 The biggest joy of making these type of desserts is not only the low net carbs but also avoiding the heat. You see, even if you have the best HVAC system, being in the same vicinity as a 425-degree oven for a couple hours makes a sweltering summer day even more unbearable. 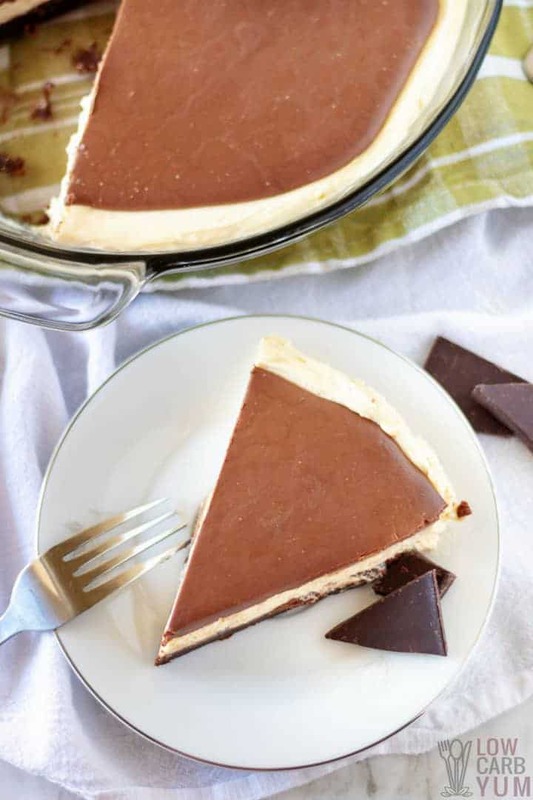 Ready to make the chocolate crust for this easy no bake chocolate peanut butter pie? 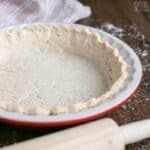 To make the crust, you’ll need a cup of almond flour, a few tablespoons of cocoa powder, and 1 1/2 tablespoon stevia or monk fruit extract or other low carb sweetener. You’ll also need a tablespoon of coconut flour and 1/2 cup of unsalted butter. 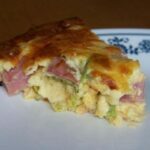 Some people in the low carb community use konjac flour as a thickening agent. 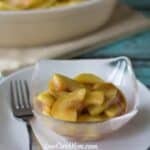 It’s the same flour that’s used to make shirataki zero-carb noodles like “Miracle Noodles.” I don’t use it in this recipe, but if you do, it’s a great substitute for regular flour. As I mention above, I have almost 30 no-bake desserts on LowCarbYum so far and almond and coconut flours have done the trick every time. 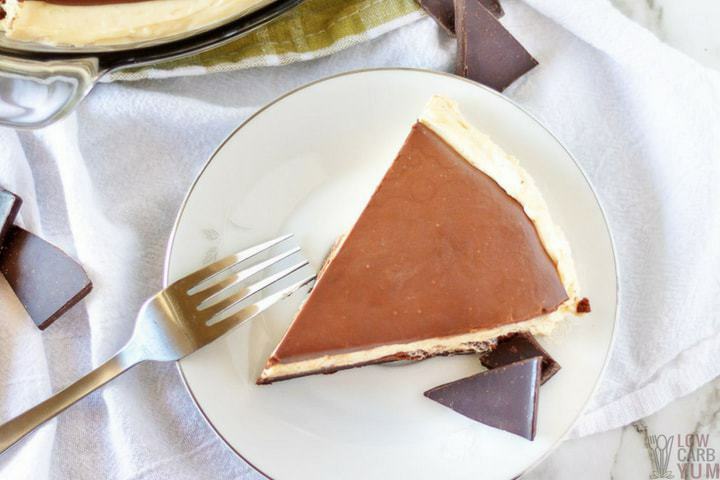 Now that you have all the ingredients for the base of this easy no bake chocolate peanut butter pie, it’s time to melt the butter. I find that it helps to turn on the stove for about a minute on medium-low before adding the butter to a skillet. Once the butter has melted, pour it into the microwave-safe bowl. Next, combine the crust ingredients and add to the melted butter. Mix the ingredients. You can use a fork to blend everything together. Press the crust firmly into a 9-inch pie pan. But before you do, spray the pan with non-stick cooking spray. I like Spectrum Natural’s coconut oil spray. 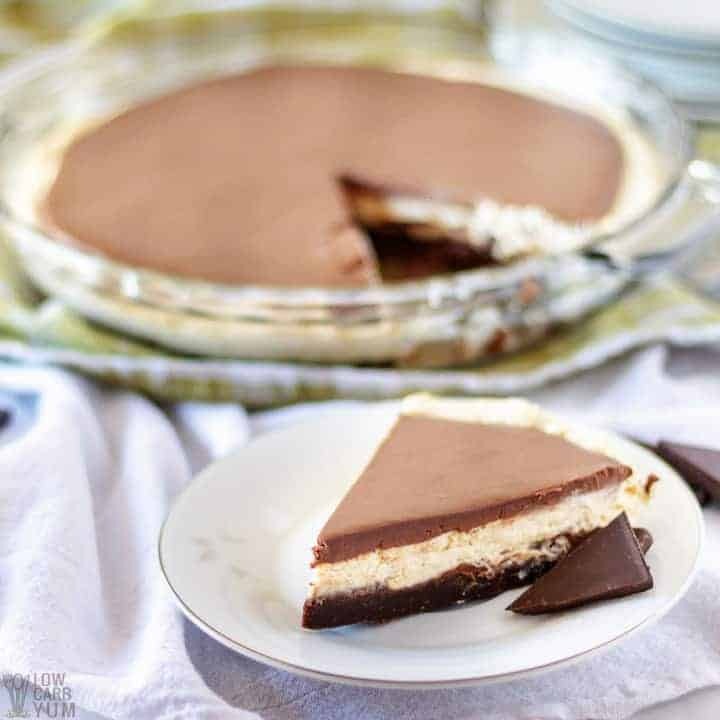 This no bake chocolate peanut butter pie isn’t instant so you’ll have to let it sit in the fridge for a couple hours to let the crust settle and cool. So go ahead and place it in the fridge now. 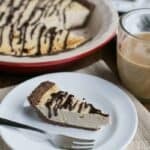 For the filling, you’ll need full fat cream cheese (yes, full fat; the fat will help prevent cravings for high-carb foods), creamy peanut butter (buy organic if you can) and vanilla extract and heavy cream. 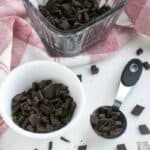 And to get the sweet taste, you’ll also need a little powdered low-carb sweetener. I like to use either Sukrin Melis or Swerve Confectioners. 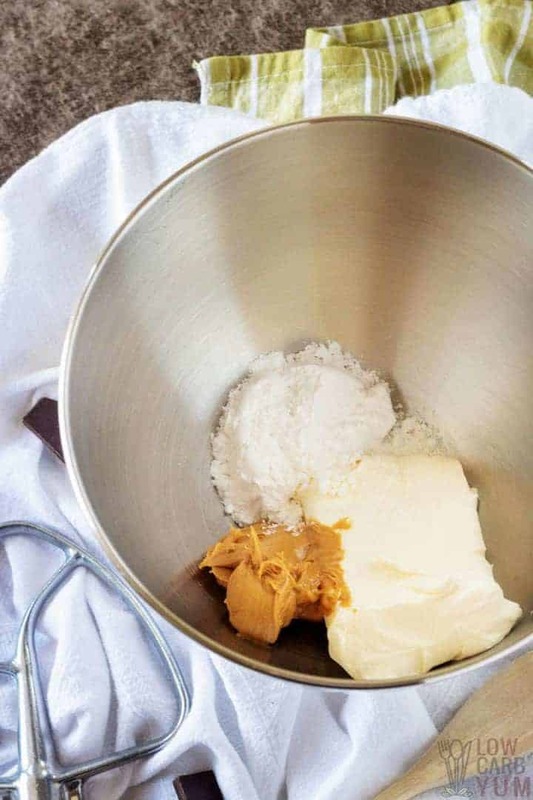 These ingredients, minus the whipping cream all need to be mixed until a perfectly-smooth consistency is achieved; just like a high-sugar pie. And you’ll want a hand-mixer in a large bowl or stand mixer to create the filling. Now, it’s time to add the heavy cream. Blend it with the other ingredients on medium-high speed. The pie should start to thicken and hold a peak. Finally, pour it into the pie crust and put it in the fridge for a few hours to set. Wait. Don’t serve the pie just yet! It’s time to add the topping. Combine the chocolate and heavy cream in a small sauce saucepan over medium heat. And then whisk the two together as the chocolate melts and allow to cool slightly. I like to drizzle the sauce over the pie right before serving the dessert. But you can spread it right over the top if desired. Some additional comments about this dessert…. I find that grinding granulated sweetener with a small blender like a NutriBullet can make for a good substitute for powdered sweetener. Also, if you like more chocolate sauce drizzle and less cream, don’t use as much heavy cream in the recipe. Did your pie end up chunkier than you’d like? No problem? Simply strain some of the filling. 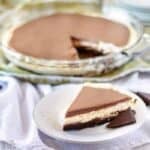 It might take a little trial and error in making this easy no bake chocolate peanut butter pie. But it won’t take making 27 different recipes like I have to perfect it. 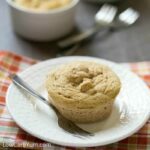 Hope you enjoy this delicious keto friendly treat! 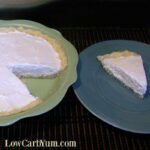 A heavenly low carb pie that requires no heating up in the oven. 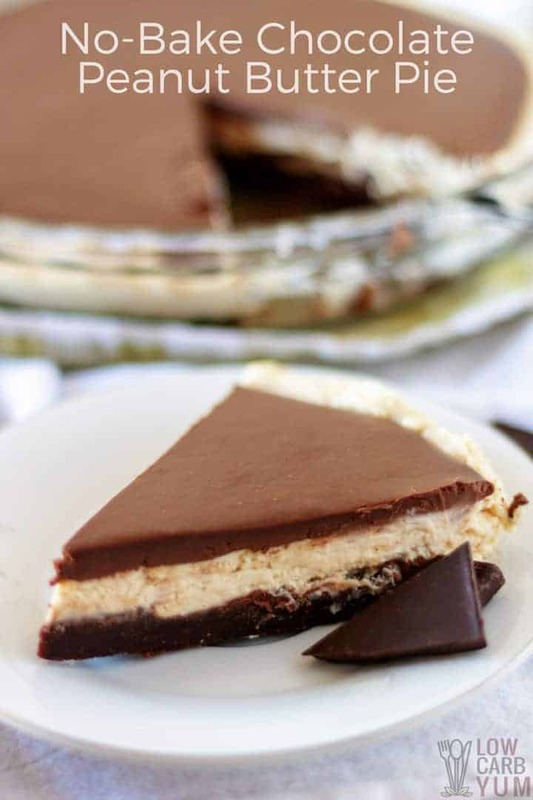 With this easy no bake peanut butter pie with chocolate, it's, well ... as easy as pie. Spray a 9in. pie pan with non-stick cooking spray and then press the crust into place. Put the crust in your fridge to chill.